In the wake of the Arab Spring, newer media and older forms (such as the daily newspaper) have gradually made it easier for Middle East countries to participate in public debates from a variety of ideological perspectives. For much of its modern history, a combination of deep nervousness and profound lack of interest seemed to inhibit or even prevent regular political conversations in the Arab World. Public spaces were devoid of political discussions: public squares in major cities showed no signs of assemblies for political purposes. If one picked up a newspaper, one was more likely to read about the comings and goings of officials rather than any sort of comprehensive political coverage. In the wake of the Arab Spring, newer media and older forms (such as the daily newspaper) have gradually made it easier for Middle East countries to participate in public debates from a variety of ideological perspectives. The state retreat from social welfare commitments have opened opportunities for a host of new informal groups and organizations to operate in areas previously dominated by officially-controlled bodies. These trends have obviously been noticed by social scientists, but scholars who focus on the large-scale political changes tend to edge into a celebratory tone: the changes are seen as potentially democratizing. 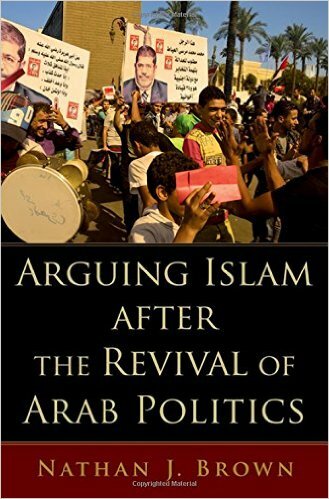 Arguing Islam after the Revival of Arab Politics presents an understanding the "revived" forms of Arab politics as they really are, and does not speculate about the democratic future these changes could signal. In particular, this book examines various sites of Arab public life to explore how politics operates. Four kinds of public spheres are brought into focus: small group discussions that straddle the public/private divide (such as diwaniyyas in Kuwait or piety groups in Egypt), public spaces of assembly (such as public squares and mosques), media (both new and old), and parliaments (an institution etymologically founded in philosophizing and pontificating rather than legislating). Further, the author gives due attention to the ways in which these spheres interact to explore how these gradations, affirmations, and subversions of hierarchy, status, and power make up the current political landscape of the Middle East. The resulting work is one that is able to bridge disciplinary boundaries, offering understandings of the new political sphere. Designed to speak beyond a scholarly audience, this volume will contribute to broader public understandings of Islam in practice and of Arab politics as those who participate in it experience it.